Local Shiba Inu, Obi, loves the sand and his beach permit. The people of South Walton share many passions. 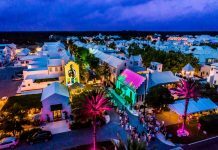 The vibrancy of each neighborhood is characterized by a love of culture and art, and of course it’s hard to live down here if you’re not a beach fanatic. There’s one other thing that many people here can’t live without — their dogs. 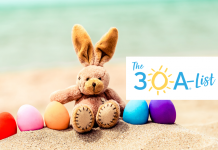 > Check out our 30A pet gear! Grayton Beach’s unofficial motto is “nice dogs, strange people” and the artsy Shops of Grayton even features a long mural with illustrations of many of the dogs who have lived in the area. 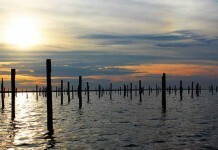 Other neighborhoods like WaterSound have included dog parks in their developments. 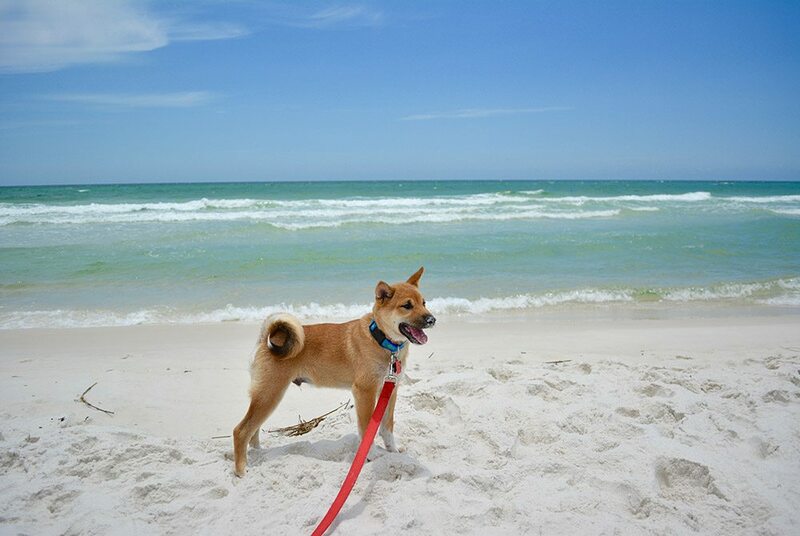 While there are plenty of dog-friendly places in South Walton, the county does not allow all dogs on the beach. 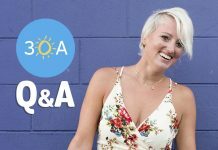 This confuses many people who live or visit here (we weren’t even sure how to answer all the questions) so we decided it was time to clear things up. 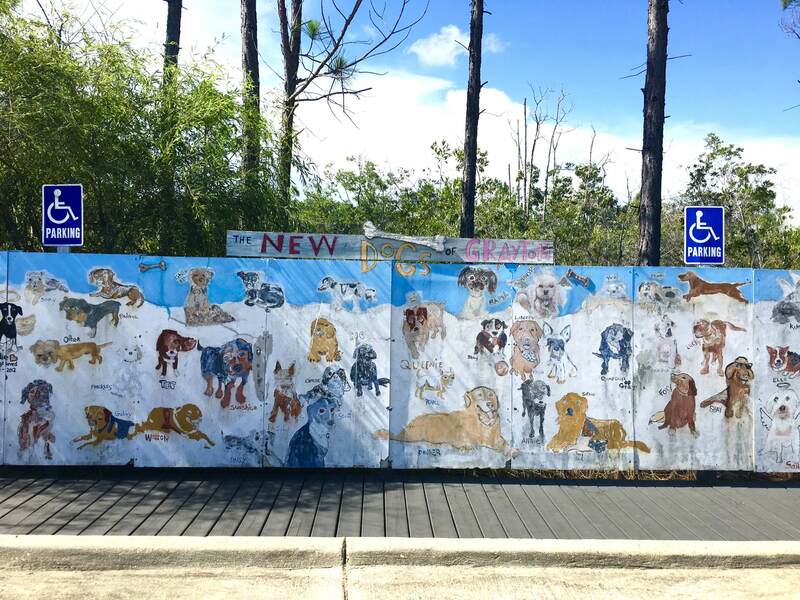 “The New Dogs of Grayton” mural shows off the town’s pooches. Just what are the rules for dogs on the beach in South Walton? In 1987, Walton County passed its first animal control ordinance, citing the need to protect citizens from uncontrolled animals as certain areas became more urbanized. 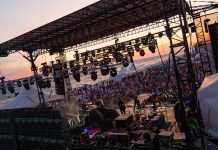 The ordinance included a section requiring residents and property owners to obtain a permit in order to have their dogs on the beach. In 2015, almost 30 years later, over 2,000 residents and property owners bought permits for their furry companions. “We are proud to be a county that considers ourselves dog friendly,” said Louis Svehla, spokesman for the Walton County Commissioners. To get a permit, you’ll need to prove that you’re a resident or property owner in Walton County. You can show that by bringing a copy of a utility bill, your driver’s license or a tax receipt to the Walton County Clerk’s office. Dog owners also must provide a certificate issued by a licensed veterinarian showing their pet has been vaccinated for rabies. It’s important to note all names on the documents need to match. That means the name your veterinarian prints on your pup’s rabies vaccination sheet needs to match the name on your application and the name on the proof of ownership or residency. The permit costs $40 and a it’s a $10 fee to replace your tag if it gets lost. Permits expire on August 1 each year but there is a grace period to renew until August 15. Once I have a permit, what are the rules? Make sure that your dog stays on a leash while walking on the beach and bring bags to pick up any waste they may leave behind. If you don’t like carrying around annoying plastic bags every time you walk your pup, local pet stores like Furry Fanatics and Bow Wow Meow sell handy waste bag holders that you can attach to a leash. When can I walk my dog on the beach? Dogs are allowed on the beach only during certain times of day. 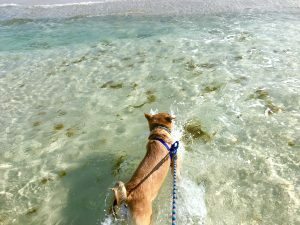 In the spring and summer, it’s from 4 p.m. to 8 a.m. and in fall and winter, it’s from 3 p.m. to 9 a.m.
Let your dog jump in the Gulf for a morning swim! Svehla said the times are in line with when most people want to take their dogs to the beach, but that they are also set up for safety. Visitors may think the ordinance is a mild inconvenience, but Svehla said it actually works to support both residents and visitors, along with their furry friends. If I don’t have a permit, what else can I do with my dog? You can skip the beach altogether and enjoy a number of activities with your pup by your side. Many restaurants in South Walton pride themselves on being dog friendly, such as Local Catch, Great Southern and The Craft Bar 30A. Most restaurants with outdoor seating allow dogs. 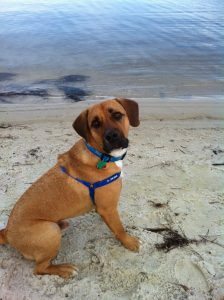 Fenway, a rescue pup from Alaqua Animal Refuge, loves the beach. If your dog loves to sprint from one side of the yard to the other, they’ll love Alaqua Unleashed, Walton County’s secured, off-leash dog park located on J D Miller road. Bring a ball or a frisbee – there’s plenty of room to run around! Visit two adorable locally-owned and run pet stores, Furry Fanatics or Bow Wow Meow, and buy your four-legged best friend a special treat or a 30A collar and leash! 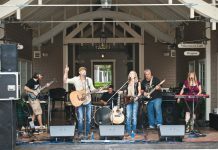 Several outdoor venues such as Baytowne Wharf allow you to walk around with your dog on a leash and enjoy the events together. Point Washington State Forest and Topsail Hill Preserve State Park are great places to go hiking or biking with your dog.They’ll love the fresh air and explorable trails! (Note: dogs are not allowed on the state park beaches, though). If your dog is a water-lover, take them to one of the coastal dune lakes and do some stand-up paddleboarding. For more information on the ordinance or getting a dog beach permit visit the county clerk’s website.